V2537. PIERRETTE ALARIE, w.John Newmark (Pf. 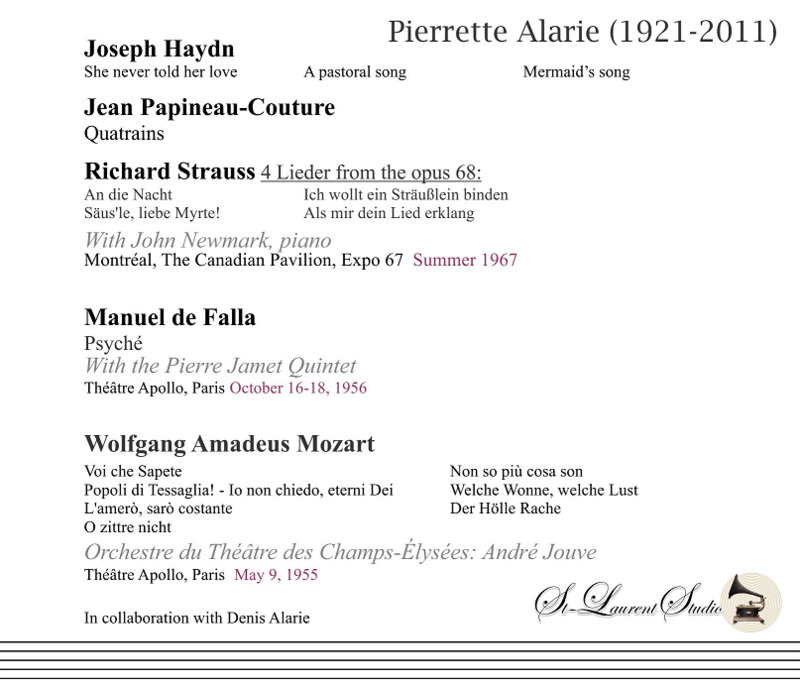 ): Songs by Haydn, Papineau-Couture & Strauss - Live Performance, 1967, Montreal; PIERRETTE ALARIE, w.Pierre Jamet Quintet: Psyche (de Falla), recorded 1956, Paris; PIERRETTE ALARIE, w.Andre Jouve Cond. : Arias from Nozze, Entfuhrung, Zauberflote, Il Re Pastore & Popoli di Tessaglia! - Io non chiedo, eterni Dei (all Mozart), recorded 1955, Paris. (Canada) St Laurent Studio YSL 33-514, from Private Collection of Denis Alarie. [Another jewel of a recital, the aria from Popoli di Tessaglia must be heard to be believed - it is truly phenomenal and seldom sung for obvious reasons!] Transfers by Yves St Laurent. "’Popoli di Tessaglia! - Io non chiedo, eterni Dei’ (K. 316/300b) is a recitative and aria for soprano and orchestra that Wolfgang Amadeus Mozart wrote for Aloysia Weber. It is famous for including two occurrences of the G above high C, according to the Guinness Book of Records the highest musical note ever scored for the human voice. Mozart completed this recitative and aria in Munich on 8 January 1779, as an insertion aria for the opera ALCESTE by Christoph Willibald Gluck. It was written specifically to showcase the superlative vocal skills of Mozart's future sister-in-law, Aloysia Weber, who was only 18 at the time. 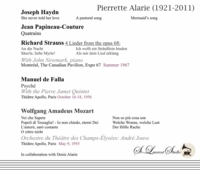 However, sopranos who are able to cope with the aria's demands have been few and far between, and hence the aria is usually omitted from performances of ALCESTE. It has been therefore redesignated a concert aria, to be presented in concerts by such rare singers as are able to deliver its fiendishly difficult coloratura. “Pierrette Alarie-Simoneau sang in UN BALLO IN MASCHERA, among other operas at the Metropolitan Opera in the 1940s. A coloratura whose light, lyric voice was often described as silvery or crystalline, Mrs. Alarie-Simoneau was known for her dynamic stage presence and refined musical interpretations. She and her husband, the renowned lyric tenor Léopold Simoneau, often performed together and were long considered the first couple of Canadian opera. 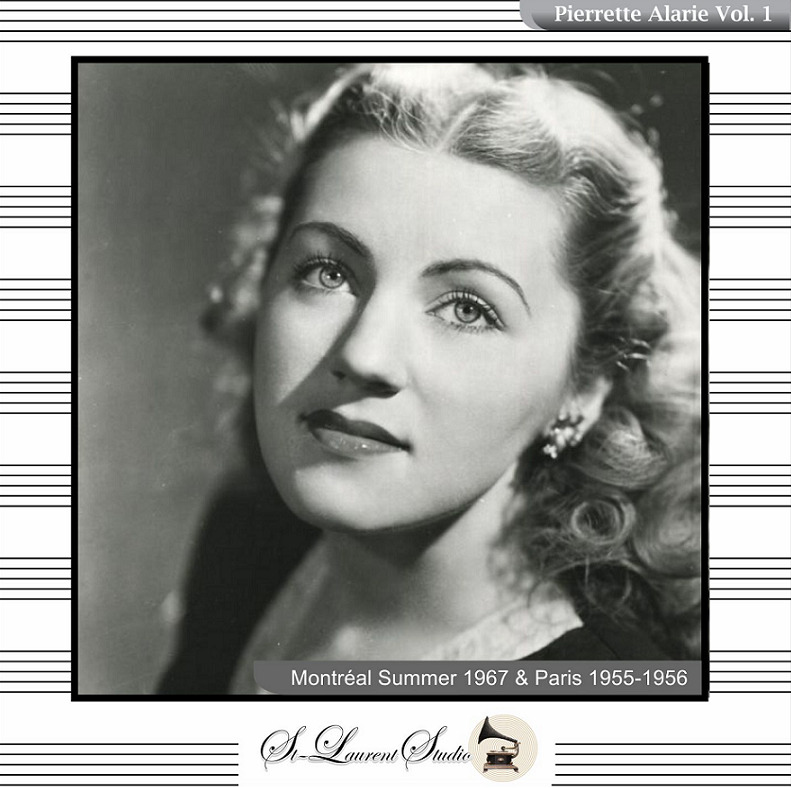 Mrs. Alarie-Simoneau, who before her marriage in 1946 was billed as Pierrette Alarie, was a winner of the Metropolitan Opera Auditions of the Air in 1945. She made her Met début on 8 Dec., 1945, as Oscar in Verdi’s UN BALLO IN MASCHERA. She remained at the Met for three seasons, appearing 26 times between 1945 and 1948. Her other rôles there included Xenia in Mussorgsky’s BORIS GODUNOV, Blonde in Mozart’s ABDUCTION FROM THE SERAGLIO and Olympia in Offenbach’s LES CONTES d’HOFMANN. Reviewing her Olympia in THE NEW YORK TIMES in 1946, Olin Downes wrote, ‘She has a brilliant coloratura, and good stage business in the representation of the stiff gestures of the mechanistic doll’. Mrs. Alarie-Simoneau also sang with the New York Philharmonic, the Paris Opéra-Comique and the Salzburg, Aix-en-Provence and Glyndebourne Festivals. Her rôles over the years included Rosina in Rossini’s BARBER OF SEVILLE and the title rôles in Delibes’ LAKMÉ, and LUCIA DI LAMMERMOOR.